As Chrysler's 2011 Rookie of the Year, Jeep's 2012 Grand Cherokee enters its sophomore season with minor enhancements (improved fuel economy, revised automatic transmission for V8 models) added to what in 2011 was an all-new architecture. And this all-new Jeep Grand Cherokee did for the segment what many manufacturers have – with their redesigns – refused to do: retain real off-road capability while improving on-road dynamics, interior comfort and overall refinement. Helped in no small way by an all-new V6 as standard equipment, 2012 sees the bar raised an equal amount on the upper end of the Grand Cherokee ladder with an all-new SRT8, the brand's performance halo. This is the bigger/badder variant of what is already a very responsive platform. If you envision using your SUV for both "sport" and "utility," the 2012 Jeep Grand Cherokee is tough to beat. In the Snowbelt Jeep's three 4WD systems provide needed security through all four seasons, while the Grand Cherokee's 2WD system and its rear-wheel-drive (RWD) architecture provide a balance of handling and traction not (typically) available in front-wheel-drive crossovers. Given the very big changes made in 2011, this is a year of tweaking a "still new" redesign. V6 models receive an electrohydraulic power steering system, while the V8's automatic transmission now provides six speeds when shifted in manual mode. And the HEMI-equipped SRT8 is revived, with 6.4 liters and 470 horsepower of urge. At its price point the new-for-2011 Grand Cherokee was one of the most capable on- and off-roaders available. The key is adaptation of an all-independent suspension for enhanced on-road composure and comfort, while not compromising its prowess when the pavement becomes unpaved. And for those with a real penchant for the "road less traveled," Jeep's available Quadra-Lift air suspension (4x4 only) impresses with its ability to clear large objects off-road, while hunkering down beneath the turbulent air at higher on-road speeds. Of course, while giving the chassis and suspension its appropriate due, we shouldn't forget powertrains. The new V6 (2011) is a huge improvement over the previous 3.8-liter lump, the HEMI has recently gained improved efficiency with its fuel-saving, multi-displacement technology, and the SRT8's 6.4 liter can give Porsche's Cayenne a credible run for its money. Finally, the Grand Cherokee's power-assisted steering feels better connected to the wheels, and the wheels – via careful attention to spring and shock rates – feel better connected to the road. Available on 4WD models only, the Quadra-Lift option allows Jeep enthusiasts to join the rarefied "air" of Land Rover and Range Rover customers with adjustable ride height fully compatible with virtually any road or off-road condition. What is described as "normal ride height" provides just over eight inches of clearance for improved fuel economy via enhanced aerodynamics. If you're venturing off-road, you can adjust the clearance upward by 1.3 or 2.6 inches, while, if parked you can lower the vehicle 1.5 inches. The lower figure, of course, eases passenger loading and unloading. In between tax hikes, the design team at Jeep has thrown a bone to the nation's off-roading affluent with the best reason yet to opt for "natural" hide. The leather for the Overland Summit seemingly covers everything in the interior of this grandest Grand Cherokee except the windshield. While wishing they wouldn't spell the model designation out on the seat itself, those popping for the top trim will be rewarded with each and every drive. In its redesign of the Grand Cherokee for 2011, the Chrysler design team executed what can only be called a seismic shift in both design and material selection. In its previous generation (2006 through 2010) the Grand Cherokee was notable for hard plastics and, to a lesser extent, hard seating. Further, the rear seat was short on legroom and difficult to access. With a longer wheelbase the rear seat is made much more accessible, and once inside you'll enjoy expanded use of soft materials, real wood trim (in upscale variants) and a much more concerted effort to make the driver and passenger experience everything you'd want in a luxury SUV. This is without – of course – the penalty of a luxury price. Today's Grand Cherokee can now credibly play on a global stage, regardless of whether that stage is asphalt or rock. There's a unity to the new Grand Cherokee sheet metal that we haven't seen since its initial launch two decades ago. To be sure, the familiar cues – 7-slot grille, hexagonal wheel arches and minimal front and rear overhangs – remain, but the whole now comprises various elements much better integrated than before. And visual upgrades in all trim levels, from base Laredo to Overland Summit, result in a 2012 Grand Cherokee family looking decidedly more upscale than previous generations. We especially like the wheel-and-tire fitments, in combination with shortened overhangs; even the Laredo's standard 17-inch alloys fill the wheel wells in a capable, off-road-worthy fashion. 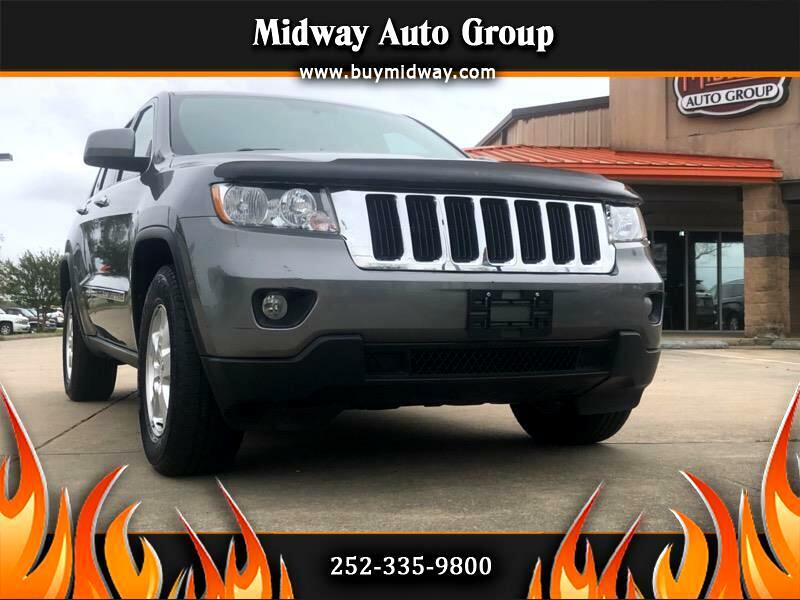 Despite a modest base price of around $28K (2WD), the 2012 Grand Cherokee comes with dual-zone A/C, rear liftgate "flipper" glass, remote key fobs, Jeep's Media Center 130 AM/FM/CD radio, leather-wrapped steering wheel and 17-inch alloy wheels. Those placing a premium on active safety will enjoy standard ESC (electronic stability control), electronic roll mitigation and ABS. And interested consumers should note that in combination with a slight decrease in base window sticker (for 2012) comes a realignment of standard equipment and optional extras. For those wanting to keep the MSRP low and the appearance of their new Grand Cherokee up(scale), the Laredo X should check most boxes, as it provides a number of enhancements – cosmetic and functional – not available on the base Laredo. And for those wanting to enhance the Jeep experience even further, a number of chassis improvements will do just that, beginning with Quadra-Drive II (includes 2-speed transfer case and Hill Descent Control), Quadra-Lift Air Suspension (adjustable ride height for both off-road adventure and on-road composure) and Selec-Terrain. Selec-Terrain is Jeep's electronic take on all-season capability, allowing for five traction control settings: Automatic, Sport, Snow, Sand/Mud and Rock. With the reintroduction of the Grand Cherokee SRT8, the Jeep customer can enjoy a veritable "holy trinity" of exciting powertrains. The standard 3.6 liter approaches V8-like horsepower and torque levels, while admitting that even when connected to the 2WD platform it has a great deal of mass to motivate. The 5.7-liter HEMI benefits from multi-displacement technology; based on need, the HEMI will operate on all eight cylinders or with reduced demand, only four. And with the increased displacement, horsepower and torque of the HEMI, owners can enjoy an enhanced towing capability (7,400 pounds versus 5,000 pounds in the V6). The SRT8's 6.4 liters and 470 horsepower bring new life, and a nationwide network of dealers, to the hyper-performance SUV segment.